It's very common to have more seedlings than you need. Sometimes, you sow extra seed to ensure that you end up with enough plants for your garden. Sometimes, as is the case with beets, one "seed" is actually a cluster of seeds, and you have to get rid of all of those extra plants that pop up. Most often, our first instinct when thinning seedlings is to simply pull them out, the way we'd pull a weed. The problem with that is that pulling a seedling can result in damaging the root system of the seedling you want to keep. If seeds were sown fairly close together, the root systems can very quickly start growing and tangling with each other. So if you pull one plant out, you can easily end up pulling out or damaging other nearby plants. 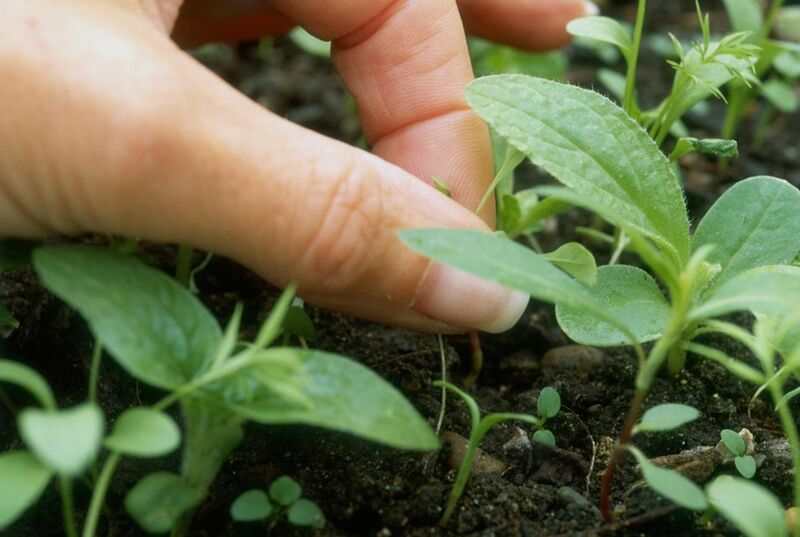 An easier, safer way to thin seedlings is to use a small pair of scissors to snip off the seedlings you don't want. Just snip the stem at soil level, pick the trimmings up off of the soil (if you're thinning seedlings in flats -- if you're thinning out in the garden, this isn't necessary) and move on to the next seedling to be thinned. Very easy!